At the same time, only about 22 per cent of people with gambling problems seek help for their gambling. However, people with gambling problems may seek help for a mental illness, without their gambling problems being recognised. Previous research suggests there may be high rates of gambling problems in people seeking treatment for a mental illness, but this had not been explored in an Australian context or in a large sample of patients. This project explored the level of gambling harm experienced by people seeking treatment for mental illness and the attitudes and behaviours of clinicians in mental health services. The study also tested a variety of screens for problem gambling, to determine a recommended screen for use in mental health settings. 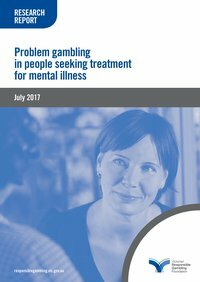 explore suitable problem gambling screening instruments and service responses within Victorian mental health settings. Given the high rate of problem gambling in patients attending mental health services, and that one in two patients who gamble are experiencing gambling harm, there are significant opportunities for prevention, early identification and intervention for this group. The findings of this research indicate that a brief screening tool would be effective in supporting earlier identification of problem gambling within mental health patients, and could easily be added to existing intake processes. Comprehensive training in assessing and managing gambling harm, as well as improved cross-sector partnerships and referral pathways would also help ensure patients with mental health and gambling issues receive timely and appropriate treatment. The report also recommends further research in determining rates and patterns of gambling harm across a greater range of mental health settings, and understanding why this group is at such risk and the most effective strategies to minimise harm. This study was funded by the Foundation’s Grants for Gambling Research program. Lubman, D, Manning, V, Dowling, N, Rodda, S, Lee, S, Garde, E, Merkouris, S & Volberg, R 2017, Problem gambling in people seeking treatment for mental illness, Victorian Responsible Gambling Foundation, Melbourne.